The original masters were re-visited for this release. They were in terrible shape, so we enhanced their voices slightly (some previously unheard) and did our best to clothe them properly. Their bodies remain the same. We made no attempt, however tempting, to change them. We heard: "Blasphemy"! 9 (2-9) and 10 (2-10) culled from the same masters, but never displayed before, as they were at the time (still are) considered prospects. For your amusement only. 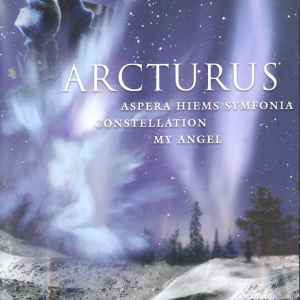 Tracks 11 - 14 (2-11 to 2-14): originally released in a ltd.ed of 500 as constellation promo-CD, Nocturnal Art Prod., Norway 1994. Tracks 15 and 16 (2-15 and 2-16): in a ltd.ed of 1100 as my angel 7"ep, Putrefaction Records, France 1991. All songs published by Misanthropy Records. Tracks 1-1 to 1-8: originally released as the Aspera Hiems Symfonia CD, Misanthropy records, UK 1996. Tracks 2-9 & 2-10: previously unreleased tracks from the Aspera Hiems Symfonia recording sessions.